DO YOU KNOW WHAT YOUR BUSINESS NEEDS? Have you done a needs analysis for your Personal training business? Do you know what the key goals and objectives are of your company and how they’ll make your business grow? Do you know what skills and competencies you need to make that all come to fruition? 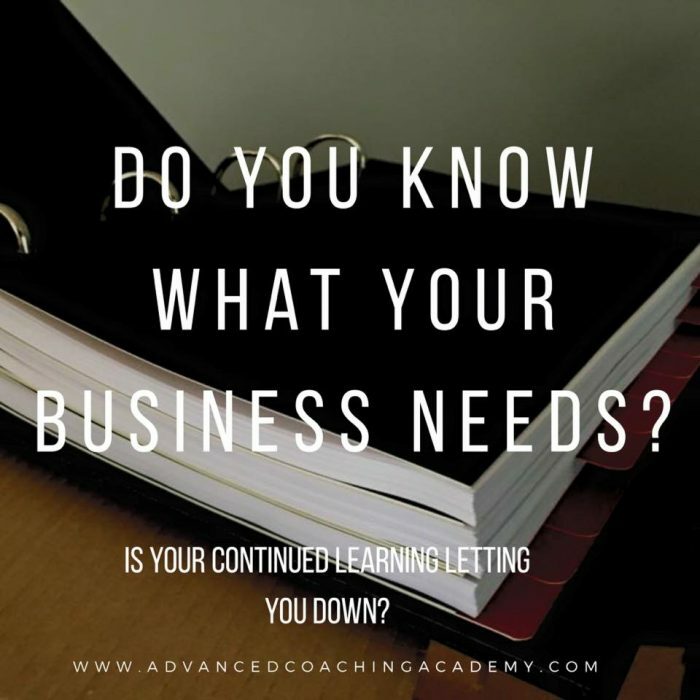 Do you know what gaps you have in your education and knowledge to deal and handle with your customers? Do you have the resources and people in place to manage your business? I spent years producing needs analysis for the fitness industry and the people in it. So I can answer and help you answer those questions. In doing so I created the Advanced Coaching Academy. A 52 week modular learning platform that answers those questions. It give you the business acumen to develop your business and create a 5 year plan. It fills the educational gaps left by your formal qualifications. It teaches application specific to the people YOU deal with as a customer. I’ve spend 20 years in the industry and delivered over 26,000 one-on-one sessions. I know the NEEDS of your clients. I’ve lectured and worked with over 14,000 trainers and coaches on how to develop and move their businesses forward. I understand your NEEDS. I created the academy as I’ve watched great coaches leave this industry. Passionate, knowledgeable and driven coaches. Ones that didn’t have direction, didn’t fill the gaps and therefore failed at turning their passion into a living. What you see in the image is the first 12 weeks of content which comes with 6 hours of video and audio content. It’s a 52 week course!!! 156 modules over 24 hours worth of video and audio content. You want to fill those gaps? The ACA was designed with you in mind. If you want more details drop me an email or leave a comment with MORE DETAILS PLEASE and let’s have a conversation about moving your business forward. The academy costs less than a cup of coffee per day. The value it brings…..you can be the judge of that.